Two miles of newly paved Columbia County Route 8 passes under the Taconic State Parkway and climbs to cycling heaven. I just finished riding Columbia County Route 8 in Livingston. You could rightly ask which Route 8 because, inexplicably, there are Columbia County Route 8s literally all over the map. There is the County Route 8 that takes you from U.S. Route 9 west into Germantown and down to the Hudson River. There is a County Route 8 in Ancram at the southeast corner of Columbia that runs to the Dutchess County line (by the way, this 8 connects to a County Route 8A). And there is a County Route 8 that runs south for eight miles from U.S. Route 9 in Livingston to County Route 11 in Gallatin. This last 8 is the one I rode today. Before I talk about the ride, I have to ask, why all the discontiguous Route 8s? Was it some highway engineer's joke? A sign maker's error? For example, when you are riding north on Route 8 near Blues Stores and you cross Route 9, you suddenly are on County Route 31. To stay on Route 8, you have to turn left at this intersection and head south on Route 9 for about a mile, then take a right to get back on Route 8 (the part that takes you to Germantown). Anyway, to clarify where I was today, I am naming the road I rode The Snyderville 8, because it runs through the hamlet of Snyderville in the northwest part of Gallatin. It includes the William and Victoria Pulver House and Snyderville Schoolhouse, which are listed on the National Register of Historic Places (you'll pass the schoolhouse on your ride). Back to biking. I am fired up about two miles of new asphalt near the Taconic State Parkway that provides a challenging climb and steep descent to County Route 11. I was having so much fun on this new blacktop that I turned around and climbed back to Parkway and did the climb/descent again. I saw just one or two cars on this section of road -- it was like cycling heaven. It was near 90 degrees with high humidity and the heat reflecting off the dark black road was ferocious. Perhaps that explains why, when I saw the farm in the photo below, it looked like a rocket launching facility. As I rode home I conceived the joke you see in the photo cutline below. At the time, it seemed hilarious. I think it demonstrates why my clients have stopped asking me to write jokes for them. The secretive Snyderville Space Center preparing for another launch of cows into space. It is the only facility in the world using cowstronauts. Here's the blog post you've been waiting for: The story about how and why I shaved my legs. Let me explain. In this new era of manscaping, about half of men partially or fully shave their legs. And most serious cyclists fully shave. But why me? After all, my legs are bowed, porcelain white, and covered with scars from five knee surgeries, and multiple falls and bumps. Why oh why shave off the shrubbery and reveal the ugly landscape beneath? Well, a nurse started it. I had surgery on my right knee a few weeks ago to remove torn cartilage. Before surgery, a nurse shaved me from mid-calf to mid-thigh. As a result, I looked like I was wearing a hair boot on my right leg. Horrified at this odd look, I shaved the entire leg. Once I had done this, I realized quickly I had to shave my other leg. As I said, this is also a cycling thing. Real cyclists shave their legs, they claim, for better aerodynamics, to make it easier to get a massage, or to make recovery from skin abrasions -- road rash -- from crashes less painful. Knowing cyclists, I'd say it's really more about showing off their sculpted legs. I went too fast on my right shin. I had no idea I needed to use shaving cream. I went into the shower and just started shaving. My wife later diagnosed me with a bad case of "razor burn." I didn't know you had to do this at least once a week. I thought like, once a month. How do women do this all the time? You can't possibly get every hair. Warning, graphic content to follow: Ingrown hairs. As for my legs, they now look like your grandfather's legs when you visited him in the hospital or nursing home. They are so shiny and white that they could replace the beacon in Hudson-Athens Lighthouse. Plus, it hasn't made me faster on the bike. Still, I plan to keep shaving for the rest of the summer. I have to go now. I am going to have a bath and shave my legs. Nothing is smoother and more delicious than peanut butter but Columbia County Route 27 comes close. 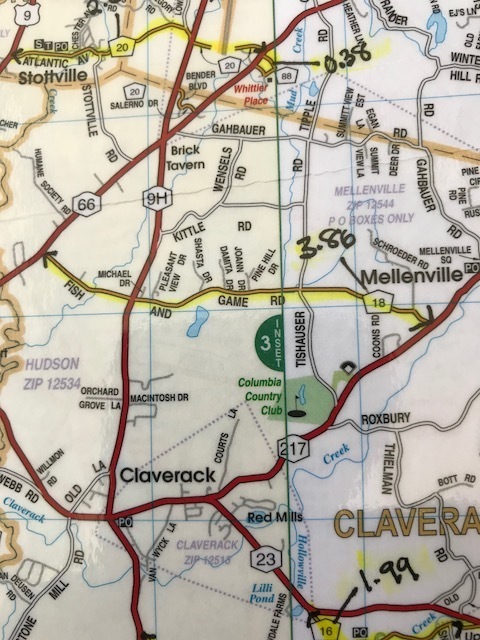 The highway runs 15.5 miles from its intersection in Claverack with State Route 9H/23, through the hamlet of Churchtown, into Taghkanic, and terminates at County Route 7 in Copake. Sections of it have been closed in recent summers by bridge reconstruction, making it impossible to ride its full length. On Saturday, in my first serious outdoor ride of season, I pedaled it end to end. This ride is one of my favorites in the county because it has everything. The climb out of Churchtown south into Taghkanic is about an 800-foot gain with max gradient of 7 or 8 percent. It is a good place to do hill repeats and practice descending. Plus, the tombstones in the cemetery at the bottom of the hill motivate me to keep riding. 27 features a Plowman's Tale: The area was mined for iron for agricultural purposes. Most of the road was resurfaced with asphalt last year and its smoothness would make a billiard table envious. The highway features farms, Chrysler Pond, views of the Taconic Range, mature deciduous forests, and now a new parking area for access to the state DEC's 690-acre Doodletown Wildlife Management Area (habitat for the threatened New England Cottontail). Traffic is light and the shoulders are as broad as John Wayne's. The section of the highway from Churchtown north to 9H/23 is being resurfaced this spring so the full 15-plus miles will be, as Bruno Mars sings, smoother than a fresh jar of Skippy. Remember my 1-to-5 rating system for highways: "COws ("Cows" + "ow") for pavement quality; "Churches" (as in Frederic) for scenery; and, "Ventouxs" for hills (as in Mt. Ventoux in France). COws: 5 -- Listen to the sweet sound of your tires whirring on new pavement. Churches: 4 -- Nearly 70% of Bicycling readers prefer rolling hills, woods, and quiet farm and country roads. Check, check, check, and check. Ventouxs: 3 -- Challenging if you do "repeats." "Whoa, tap the brakes, Spokesman. Is this blog some low-rent version of the Harvard Business Review's Management Tip of the Day? I thought it was about cycling." This is about cycling. In my insane quest to ride every single inch of Columbia County highways (meaning roads built and maintained by the county), I found making connections was essential. By the way, "Tap the brakes?" Really? That sounds like some sad "master of the universe" conference room trash talk (actually, someone once said exactly that to me in a conference room). 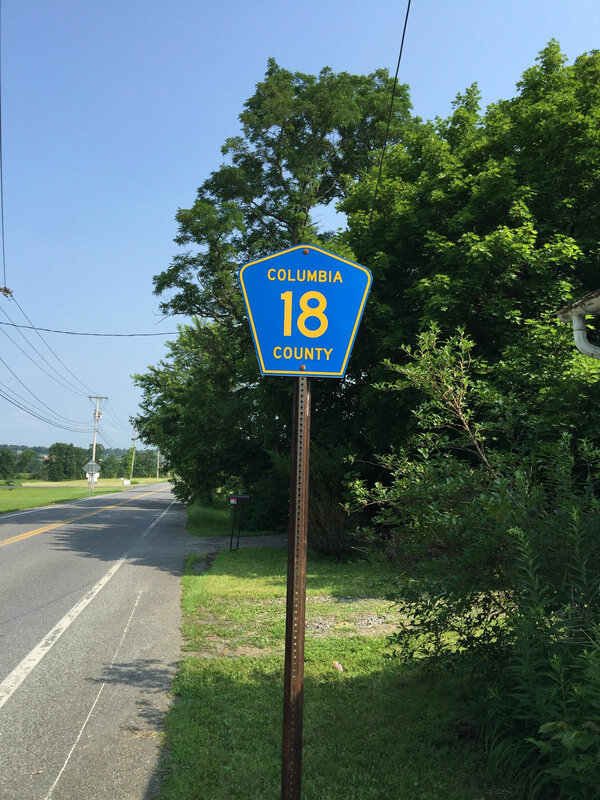 Columbia County Route 18 in Claverack and Greenport is a great example of a connector road. It is known to most people as Fish and Game Road because the Hudson Fish and Game Club is located there. It is only 3.8 miles long but from my home in Livingston, it allows me to get off State Route 9H (a terrible riding road) and brings me east to State Route 217. A quarter to half mile northeast off 217 near the village of Philmont is the southern terminus of Columbia County Route 9, which is one of the best riding roads in the area (more on 9 in another post). By the way, connections were how I first became acquainted with the county highways. When I was in college, someone who knew someone got me a summer job doing highway construction for the county. Not every day was construction. On rainy days, the foreman would send us out in a truck to pick up road kill. But that's a story for when you aren't eating. I will write about other "connector" roads in postings about the best county routes to ride. But I thought I would feature 18 on its own because it is my favorite connector and gets me to challenging riding in the northern Columbia County. It's like the booster rockets on the space shuttle that get you off the ground before the real trip begins. 18's terrain is rolling. It is lined with orchards, ponds, and crop fields. If it were repaved, it would be a top 20 county road on its own because of the scenery. Heading west toward 9H on my return home, it offers some of the best views in the county of the Catskill Mountains. So use 18 to connect to Ghent, Chatham, Austerlitz and other points north, where it is hilly and you will definitely need to tap the brakes. One of my hand-drawn maps used when my phone's GPS was useless. Near the northeastern corner of Columbia County in the Hudson Valley of New York is County Highway 30. It hugs Queechy Lake, which is nestled gently against the Berkshire Mountains. Columbia County Highway 30 is only 1.4 miles long and flat, not remarkable by cycling standards. But in my case, it was the end of my two-year cycling quest. During 2015-16, I rode solo on Columbia County's highways. Every inch of every one. I estimate that I biked more than 1,000 miles, including 200-plus miles of county highways plus state and local roads to get to them. It started on half-mile long Columbia County Route 12 that goes by Abby Rockefeller's, Churchtown Dairy, and ended a year later on County Route 30. I developed a plan on a county map and then crossed off highways as I "collected" them. 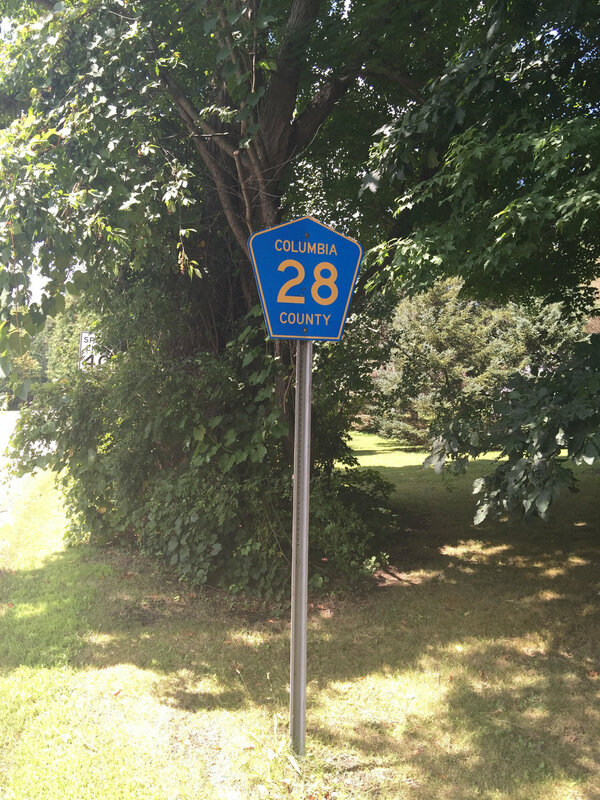 I took photos of every five-sided blue and yellow county road sign. I stopped at about every convenience store in the county for Builder Bars, Gatorade, and biology breaks. I drew paper maps for areas where my GPS failed. Most importantly, I enjoyed some of the best bicycling in the world right here at home. Columbia County sits on the Hudson River in southeastern New York about 100 miles north of Manhattan. Its western border is the river with the Catskill Mountains in view beyond. Its eastern border is Massachusetts and the Berkshire Mountains. The county is as sparsely populated with people -- about 60,000 in 648 square miles -- as it is overflowing with dairies, orchards, wineries and a wide assortment of other farms. The county highways are extremely well maintained (more on that later), relatively lightly traveled, and diverse in their grades. All-in-all, the roads could be described as "rolling" with a few tough climbs closer to the Berkshires. There is a great website that suggests routes in the county; that is not my mission. I am chronicling my rides on county rides and rating them by their beauty, grade, and road condition. I will rate each road on a scale of 1 to 5 for pavement quality using “COws,” a corruption of “cows” and “ows.” Same for scenery using “Churches,” in honor of landscape artist Frederic Church, and road grade in Ventouxs” for the great Mt. Ventoux of Tour de France fame. I will try to group roads by theme or geography. Alpha: 12 with Dairy Dome under construction. County Route 12 in Livingston is a half-mile of agricultural glory. It was the first highway I collected because it is less than a mile from our home. As mentioned, Route 12 features the Churchtown Dairy, or the “Dairy Dome” in Sheffer lingo. It also has an underground brick and stone cheese cave (I want one). Route 12 is a “connector” road, bringing you to County Route 27, which itself is a gateway to many beautiful rides. COws: 1 cow (being resurfaced in 2018). At Christmas, people gather at the Dairy Dome to sing carols to the cows. County Route 30 in Canaan, was last on my list because, honestly, I forgot it in my planning. It connects state routes 295 and 22 and has some nice views of the Taconic range.